In 1953, the CIA arrested the civilian Prime Minister of Iran, Mohammed Mossadeq, and reinstated Shah Mohammed Reza Pahlavi. Mossadeq, a democrat who had nationalized the oil industry, was thrown into solitary confinement for three years. He spent the rest of his life under permanent house arrest. The Americans, with the help of the Israelis, proceeded to set up a secret police service—which would soon include expert torturers—to suppress Iranian dissent. This, along with the routine ignominy of being a client state, was used by many dissidents, including Ayatollah Khomeini, to stoke the embers of revolution. By 1978, the revolutionaries could point to an entire century of humiliation. Iran had long been the plaything of the great powers: The Anglo-Iranian Oil Company—more commonly known today as BP—was a crucial resource for the British Empire; the Soviet Union, with the help of the British, invaded in 1941; the Americans and Israelis spent half a century overtly interfering with Iranian sovereignty. As the revolution got underway, the political choices of young Iranians—as well as the trajectory of the new Iran—were always going to involve various kinds of nationalism. 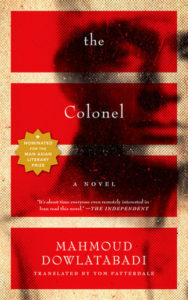 But Islamism was not the only game in town; and, as Mahmoud Dowlatabadi makes clear in his brutal new novel, The Colonel, the eventual supremacy of Ayatollah Khomeini, and the subsequent slaughter of his fellow revolutionaries, was one of the cruelest and bloodiest ends that could have been imagined. To Dowlatabadi’s credit, The Colonel does not give us redemption or sentimentality: the novel, like the revolution, is a chorus of unrelenting sorrow. In the face of this cruel, personal history, Dowlatadbadi has wrought an affecting and beautiful novel. Thankfully there is a sense that things might have been otherwise in this thoroughly bleak, affecting, and beautiful novel—even if it is a minor, barely discernible note among all this sorrow. The Colonel becomes increasingly trapped in the past. As he makes his way to the funeral of his young son, a victim of the Iran-Iraq war, he is accompanied by the headless ghost of Colonel Pesyan, a nationalist hero, as well as the bloody corpse of his wife. His visions grow manic: he has “Dreams of wild cries of despair, dreams of fathers taking their sons to end it all, and of women ripping open their wombs so that no seed should take . . . and screams, silent screams of despair, muffled as if through cotton wool.” The novel seems to mimic, as it slurs between the present and the past, the work of Malcolm Lowry. The best analogies for this novel, though, are drawn from the stage, in the choral speeches of Brecht, the political choices of Sophocles, and the stacked corpses of Thomas Kidd. “Everything,” as the Colonel says, “has been tipped out like the guts of a slaughtered sheep, for all to see.” This is, presumably, the point: we are thrown into the muck of history, and given no exit. Ultra-violent Islamists replace the ultraviolent Shah; winter follows winter. 1921 is followed by 1941, which is followed by 1953, 1988 and, with scores of Israeli bombers currently warming their engines, 2012. But Dowlatabadi has done something perverse, something almost unforgivable: he’s spun from this muck a beautiful, wretched novel. Matt McGregor‘s review of The Colonel first appeared in TLR’s Spring 2012 issue, Encyclopedia Brittanica.